This pharmaceutical company’s Vaccines’ Wavre site is a new multiproduct facility that is specifically designed to manufacture Cervarix ® (company’s human Papillomavirus vaccine) alongside Engerix-B ® (hepatitis B adult vaccine), Havrix ® (hepatitis A adult vaccine), Infanrix ® (diphtheria, tetanus, pertussis vaccine ), Twinrix ® (hepatitis A and B vaccine), Pediarix ® (diphtheria, tetanus, pertussis, hepatitis B subtypes, poliomyelitis vaccine), and Boostrix ® (diphtheria, tetanus, pertussis vaccine). The formulation, filling, labelling and packaging operations of these products are subject to pre-license inspection, routine and follow-up Level 2 CGMP inspections. Complying with strict regulations is an arduous task. A company like this with sites and plants that are subject to this kind of regulatory inspections should always be inspection-ready at all times. APROPLAN was used in a customised system that involved digital checklists specifically involving said regulatory requirements. Prior to APROPLAN use, this pharmaceutical company, like most companies, still relied on the traditional pen and paper process to prepare them for site inspections. Switching to a new and digital platform was seen as a challenge. 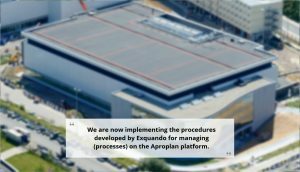 APROPLAN, through the efforts of Exquando, digitised this company’s process of being inspection-ready for internal routine inspections and during site visits of regulatory bodies. APROPLAN is currently integrated with the company’s-developed SOPs into a digital checklist. This digital checklist embodies all items needed to be implemented in each zone of the facility that needs to be inspected. The successful integration of APROPLAN to the company’s inspection SOP is a milestone for APROPLAN as it’s a completely different approach to how APROPLAN is usually used. APROPLAN has always been used as a collaborative platform in the construction industry. This project just establishes how flexible of a stand-alone yet integrated solution APROPLAN is. Since using APROPLAN, this company’s Wavre has generated a great return on investment for their people on the field. They have also increased the traceability of items that were flagged during inspections, thereby, reducing the time to correct or repair said annotations, which significantly contributes to a reduction in overall risks. This pharmaceutical company notably exhibits APROPLAN’s use and benefits when it comes to both in-house and regulatory inspections. Admin workload has greatly decreased by half and a lot of time has been saved all the while performing efficient and effective work on regulatory compliance and document management. Contact APROPLAN today to start discussing how your company can be inspection-ready at all time. Whatever authority body you have to comply to or whatever regulatory inspection you have to pass, APROPLAN can help you to be always inspection-ready.